I originally had our latest session of 5 Questions scheduled for today, but yesterday I stumbled upon a marvelous, time-sensitive story, and I really wanted to share it with the PuzzleNation audience, because it exemplifies the very best of the puzzly gaming community. In last week’s Follow-Up Friday post, I briefly discussed Joe Michael MacDonald’s marvelous version of Qwirkle designed for colorblind players. And lo and behold, here is a Kickstarter campaign with even loftier goals. The folks at 64 Oz. Games are in the final hours of a project called Board Games: Now Blind Accessible, wherein they produce specialty sleeves and other modifications for established board games and card games, allowing visually impaired players to play alongside their sighted pals. Not only have they developed a touch-based game called Yoink! 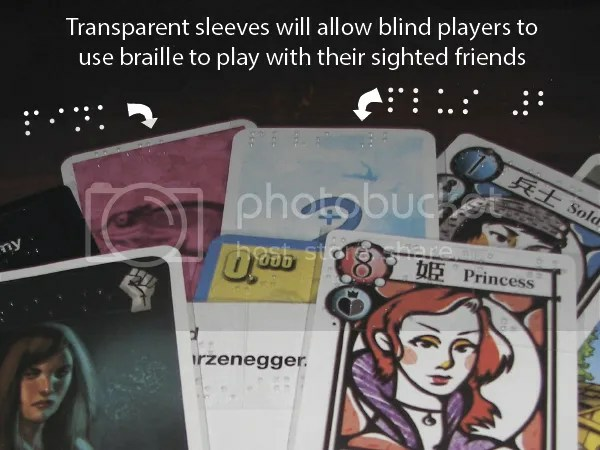 that is based on tactile gameplay, but a combination of Braille and clever use of QR codes has opened up games like Munchkin, King of Tokyo, and numerous roleplaying games to a previously excluded audience. This inclusive spirit is brilliantly typical of the puzzle and game communities, since so many members — both designers and players/solvers — want nothing more than to share their love of games with the world. It’s an absolutely wonderful idea, and although there are only a few hours left to donate to this very worthy cause, I’m overjoyed to say that they’ve raised more than double their hoped-for campaign total! This is Kickstarter and the puzzle and game communities at their best, and I’m glad I discovered it in time to share it with my fellow puzzlers. This entry was posted in Games, PuzzleNation, Puzzles and tagged 64 Oz. Games, 9th Level, Announcements, board games, Board Games: Now Blind Accessible, Cards Against Humanity, cheapass, colorblind, Follow-Up Friday, games, Geeking Out, joe michael mcdonald, Kickstarter, Living Worlds, Living Worlds Games, Ninth Level, Pop culture, PuzzleNation, qwirkle, Rio Grande Games, rubik's cube, tactile, visually impaired, yoink by gmdirect. Bookmark the permalink.